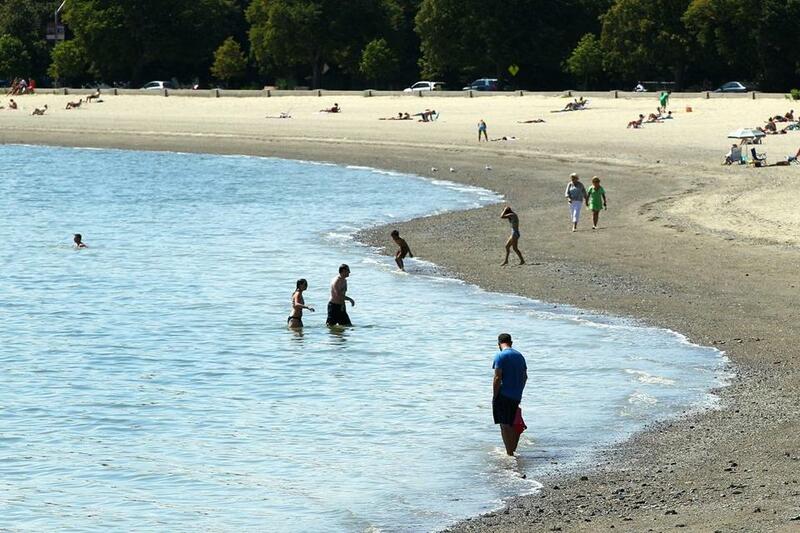 Lower temperatures this August have cut short beach time for many in Greater Boston. It has been a summer without much to complain about — no heat waves, not a ton of oppressively hot days. It has been, quite simply, pleasant. And therein lies the complaint. Weather has a past. How it feels to each person has a lot to do with how they feel about that past. By this time last summer, Boston had 17 days with temperatures above 90 degrees, including a streak of seven in a row that hit in mid-July, according to the Blue Hill Observatory. This year, the mercury has topped 90 degrees only four times, the least since 1997, according to the National Weather Service. In between the summers we had that winter. The one that felt like it would not end. The one where the mean temperature was 27.3 degrees. The one that dropped 81.6 inches of snow, more than 3 feet of snow above the average. The one that burned the term “polar vortex” onto the psyche. Yeah, that one. That winter erased memories of the oppressive summer. But this summer, according to many, has not managed to do the reverse, and as we arrive at the end, with kids going back to school and sweaters coming out of the closet, there is a sense that pleasant was not quite what we needed. 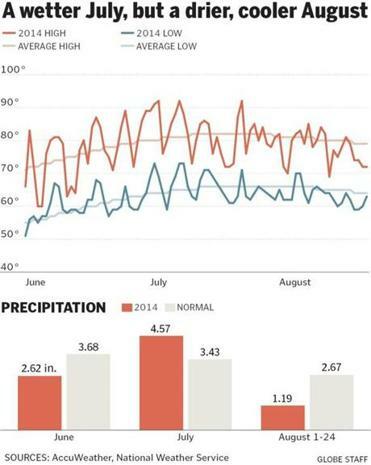 As far as temperature goes, this summer has been fairly average. June and July were each .7 degrees above normal, while August has been 2 to 5 degrees cooler on average as compared with past Augusts, according to National Weather Service meteorologist Matt Doody. There are, certainly, many upshots to this unfamiliar thing, this “pleasant wave,” if you will. “It’s not too humid, so it’s good hair weather,” Dava Berman, 26, of Somerville, said last week while the wind, as if on cue, swept her blond locks into the breeze. Boston resident Caitlin Jarvis sunbathed on Carson Beach on Sunday. She said lower temperatures this August have thwarted her beach plans. Weather has a past. And it has a future, and that is part of the problem. What feels cool and pleasant now can trigger fear of what’s to come. Last week, that fear got a diagnosis when The Old Farmer’s Almanac came out. Until then, we have August. Good old, I-can’t-believe-it’s-almost-over August. On Monday, highs will be around 80 degrees, said Doody. There will also be a sea breeze, he said, and lows will be around 60 degrees. The rest of the week will see a warming trend, the meteorologist said. Wednesday will see the warmest temperatures in the upper 80s, but there is a chance for showers or thunderstorms in the evening. But by Friday, temperatures are expected to cool as we begin the final march toward fall, and everything we know is beyond. “August is the Sunday at 4:30 p.m. of the calendar year,” is how Christine Baron, a college professor from Beverly, describes it. Globe correspondent Melissa Hanson contributed to this report. Billy Baker can be reached at billybaker@globe.com. Follow him on Twitter @billy_baker.